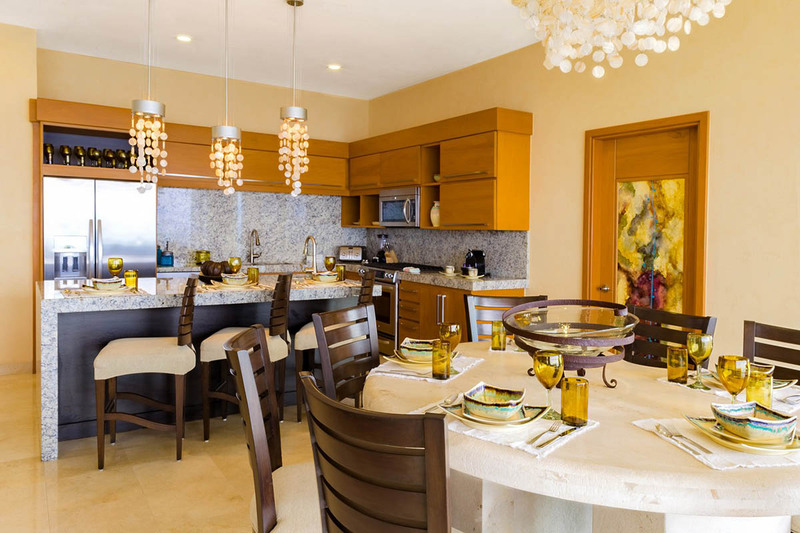 This week’s spotlight is on the spectacular Three Bedroom Panorama residence at Garza Blanca Preserve Resort & Spa. This spacious and luxurious private beachfront residence comes with 3 bedrooms and 4 bathrooms spread out over an expansive 4214 square feet. The moment you step into the Three Bedroom Panorama, your senses will be overwhelmed by the attention to detail and fine touches everywhere you look. The breathtaking Pacific ocean will appear to become one with the interior as you open the panoramic sliding doors that run the full length of the extensive wraparound terrace. Garza Blanca’s Signature beachfront residence offers unparalleled ocean and mountain views, as well modern and chic furnishings. Come with us on a journey and step into the Garza Blanca Three Bedroom Panorama suite where your beachfront residence dreams could soon become reality. 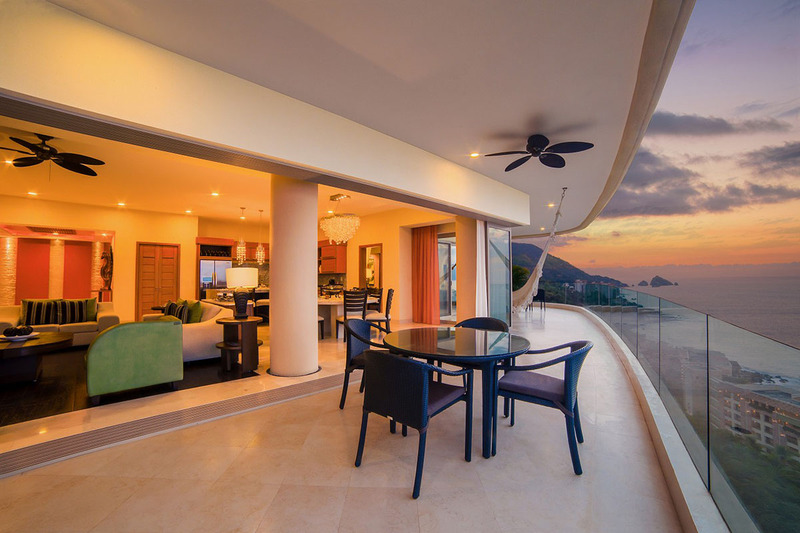 Garza Blanca’s elegant overhead lighting will immediately catch your eye as you open the solid construction wood door and step inside to reveal an outstanding piece of Puerto Vallarta real estate. Sparkling crystal chandeliers and elegant light fixtures will brighten up the space, while at the same time creating a soothing feeling of warmth and comfort. The plush living room has plenty of space for your family and guests, and a high quality flat screen TV gracefully blends in for entertainment purposes and more. Head into the upscale chef’s kitchen where you will find beautiful granite countertops and a large, sturdy island with bar seating for three. Pristine stainless steel appliances including a full oven, stove, refrigerator, freezer and microwave await to give you the ultimate dream kitchen experience. Imagine yourself enjoying a sparkling glass of champagne or a full bodied glass of red wine as you whip up a delicious meal for your family or guests. The granite island has convenient bar stool seating and plenty of space for prep work to make any cooking experience satisfying yet practical. Want a little privacy while you work your culinary magic in the kitchen? Your guests will be thrilled to step out onto the spacious terrace to admire the endless Pacific Ocean views that just don’t quit. Garza Blanca private terraces are the perfect space to sit back and relax while you enjoy a refreshing drink. Lay back and swing in the comfy hammock as the spectacular Banderas Bay offer impressive vistas that are impossible to beat. You and your guests will find it easy to spends hours simply gazing at the relaxing waves, and taking in the tropical natural beauty that surrounds you. 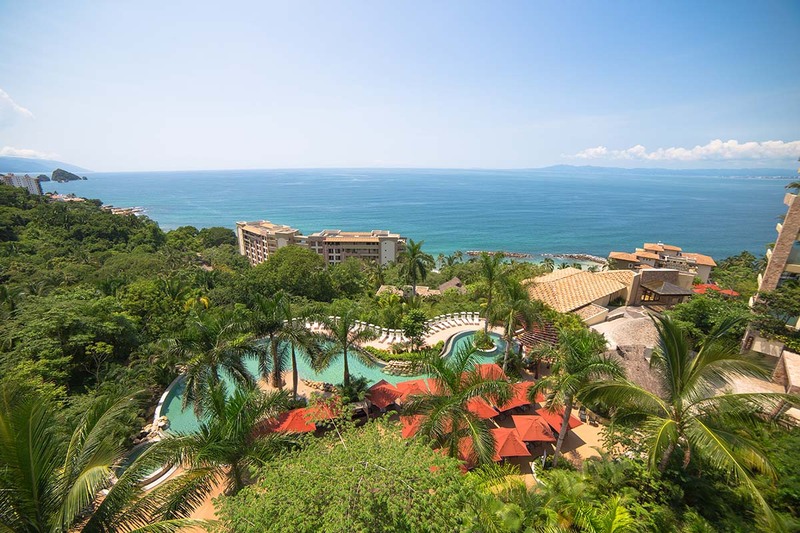 Garza Blanca’s Three Bedroom Panorama beachfront residence is situated on a hillside nestled amongst the lush Sierra Madre mountains. Being in close proximity to the aromatic, green vegetation will refresh your spirit and visually offers a dramatic contrast to the crystal clear blue waters below. Back inside, you will find each Garza Blanca beachfront residence bedroom extremely open and decorated with only the highest quality furnishings and decor. From a comfy king bed with luxury thread-count sheets to opulent sitting rooms, the Master bedroom will be an true oasis that you will love to seek refuge in time and time again. In the Garza Blanca’s Three Bedroom Panorama’s Master bathroom area, a modern soaking tub with ocean views will be the ideal place to take a bubble bath and let your worries wash away. A separate shower, dual vanities and a vanity mirror sitting area will give everyone their own space to make getting ready an enjoyable and deluxe experience. 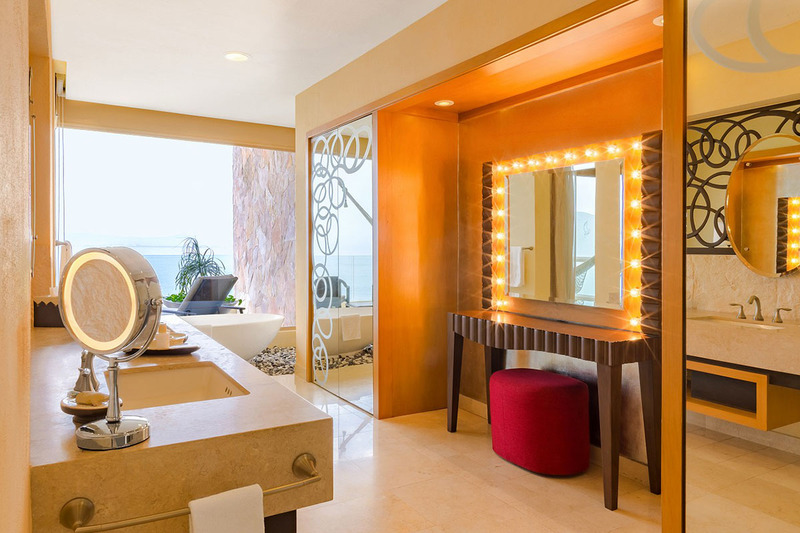 Two additional large bedrooms with private bathrooms complete Garza Blanca’s Three Bedroom Panorama so that everyone enjoys their vacation time to the fullest. There is even a wet bar area in one of the second bedrooms, so your guests can enjoy a cocktail or two when getting ready without even having to leave the privacy of their own room. 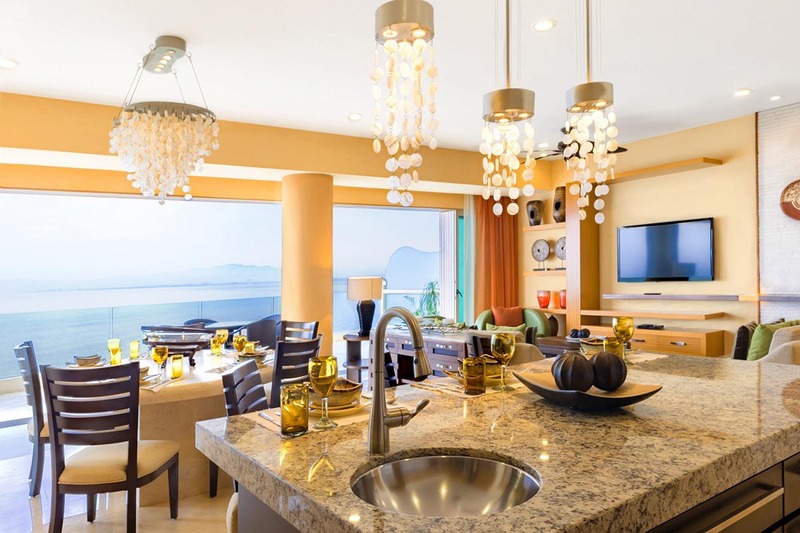 The Three Bedroom Panorama at Garza Blanca Preserve Resort & Spa is Puerto Vallarta real estate beachfront residence extravagance at its best. Visit Garza Blanca Preserve Resort & Spa today so you can see why they say it’s where tranquility and luxury merge!